Have you tried a good Shove Router ? That gives the operator control, but manages the tedium in the computer. A different sort of automation. I've never used a shove router, but I could see its benefits if it let me manually route while enforcing design rule constraints by rippling adjacent traces to their minimum separation distance. I guess that's what such a router does, right? But those were the days of boards covered in TTL chips and thousands of logic signal connections to be made and not crazy high frequencies. Once you have your major fixed points pinned down, connectors and such, and your power planes in place the auto-placer and auto-router could do a reasonable job of all that heavy lifting and getting the shortest signal connections. It's not as if those signal connections carried huge currents. Prior to working there I worked at places where the engineers gave their schematics to teams of young girls to do the layout using black sticky tape on transparencies. I'm prepared to believe the autorouter could do as good a job as those girls, who I'm sure were not worrying about circuit sensitivities and current paths either. Aside: Please nobody start that I'm putting women down here. It's just how it was. They did an excellent job, tedious as it must have been for them, only occasionally did I suggest they move or reroute things after review. Today we use auto-routers all the time. When throwing logic into FPGA or real chips for that matter. I'm still stuck with Protel99SE and whilst I continue to evaluate "free" tools I still haven't found one that makes good use of shortcut keys and sequences so that your mind is not continually having to navigate menus vertically and horizontally etc. I do like Diptrace and I am astonished with Kicad's transformation over the last couple of years but it doesn't seem to work properly on my LM19 beta, although everything else does. Perhaps all those responding could also post a schematic and pcb that they'd like to share from their favorite tool to make it easier for the rest of us to evaluate those tools. Btw, I have found that placement is everything, and once you have that sorted out the routing is easy. Put a part on the wrong side of the board in the wrong orientation, and it's a mess. I use Eagle. No reason to change at the moment. It is easy and fast to create a library part and I have made many parts (some custom/special parts). The autoroute works well lMO. I use sunstone.com and it is a click to upload the .brd file, ordering boards is just a few minutes effort. I know they will convert from quite a few other formats too. One thing to consider with a software is how easily it integrates with your pcb/stencil ordering workflow. In my case I always like fast turn around (3 - 4 days) and I always order multiple boards on a 11”x14” panel and cut it up later. Ordering stencils is a click of a button “add stencil”. I’m sure there are other softwares that allow easy upload and ordering. While I use Protel for pcb layout, I use express schematic for schematics. I haven't used Protel schematics since autotrax schematic 3 which was a DOS/Windows 3.1 version. I need a really good reason to change from Protel 95/99SE PCB software though. It works well for manually placement and manual routing. 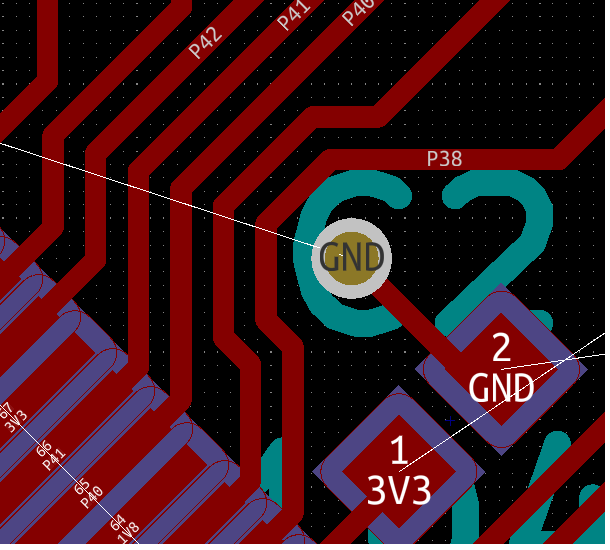 If/when I do change it will most likely be to kicad. Yes, here is a KiCad Shove example I recently uploaded, that shows a via dragged into a series to parallel traces. You can do the same thing of course with trace segments. The schematics in Protel Design Explorer 99 SE works really well and of course is nothing like the earlier versions. If you have 99SE you should try it and of course it integrates nicely in the same project with pcb where you can update the pcb from the schematic, to the degree that you permit etc. Try out the .ddb project file in my P2 PCB folder. I do 5-10 designs a year, usually not very big, but have done some BGAs. Every 4-5 years I look at what is out there to see if it is time to upgrade. I currently use old OrCAD 7 for schematics, was using version 8-12 but at one point OrCAD made it hard to share with down rev software, and was trying to share designs between a couple different companies. As OrCAD 7 was an interchangeable format I went back to that and still use it. On the PCB side I have been using CircuitMaker/Traxmaker 2000, since about 2000, and found it was easy to learn. Too bad they were snapped up by someone and it is no longer supported. So I might be the last person on the planet using it, though I see a number of PCB houses list it as known CAD system. I think most any system can be useful if you are willing to climb the learning curve. Earlier this year I jumped on the $500 version of Altium, as someone I know at a university had a license and was able to import all my OrCAD-7/Circuitmaker designs. Sounded like a way to go. Too bad, I really did not like the user interface, way too many options and way too many useless ones. For instance trying to build a new component (something I do all the time) just was not very straight forward, but Altium was happy to tell me who had the part in inventory (nice, but who cares). A few years back, I tried Eagle and DIPtrace. Eagle's free version interface drove me batty. And DIPtrace tried to change the schematic when I changed something in the layout. Not too cool in my way of design. Also at the time I tried KiCAD which was very Linux centric back then. More recently a hobbyist friend was looking to do some simple layouts, and I knew he was a Linux guy so I suggested KiCAD. After he played with it for a bit, he decided the Windows version was pretty good and that is what he used. Since then I downloaded KiCAD and first impression was, heh this might work. But haven't really jumped into it yet. If you have existing designs in OrCAD-7/Circuitmaker -> Altium, you should be able to import PCAD-PCB ASCII files into kiCAD - presuming your Altium variant can export PCAD ? 1. Presently learning to use PCBexpress. 2. Once I get some boards made for demos I will have people to do the PCB layouts. Going to check out DipTrace freeware. PS-Anybody have a DipTrace pattern for the Prop1? Several on Parallax's Open Source Design page. Under a product's "Downloads and Documentation" section, there will be DipTrace files to download. Parallax has it's own listing in the library of components in Diptrace. There are 50 product footprints listed. 1) Diptrace. I have a basic license, more than enough for my needs. Easy to add footprints. 2) Kicad. I tried kicad at the time (years ago) but it was not up to par in my opinion. Anyway for an alternative it would be my choice. Kinda stuck as I'm so used to it and I have libraries I've built up (and trust) but i haven't found anything better although Diptrace could be a candidate and now Kicad in its present form plus it now seems to run properly on my Linux Mint 19 beta. For many years I've used McCAD EDS, starting with it's first edition that came out for the Mac Plus in something like 1987. It was the first to take advantage of the Mac's graphics screen, but it was basically a glorified MacPaint with layers. I'd print onto PMT transfer film to use with photosensitized boards or to take to the PCB fabrication house. It seemed so great at the time. I'd already done my share with press-on transfer pads and tapes on vellum. Those sure did have an organic feel! I also cut some rubylith films, using a PDP7 computer to control a stencil knife. But I'm definitely not going back. Fast forward, I paid the price to keep up to date with McCAD EDS as it has evolved through the years. It is made by a small company and is not as well known as others that have been mentioned here, but they do maintain it regularly. It might not be the most powerful or best supported, I really don't know, but it suffices for my purposes. I'm the old dog who only wants to learn tricks how to use it better and most efficiently, so my answers to the survey part A and part B are the same, McCAD EDS. OK. I can understand wanting to stay with a familiar user interface, workflow, libraries etc. As a teenager I learned to ride a motorcycle on a Yamaha, gear pedal on the right, up for up down for down. I had to take my test on an old BSA, gear pedal on the left, down for up, up for down. Very confusing. Still, McCAD EDS seems to have moved with the times. I was wondering about the guys here, seemingly using actual versions from last century. Aside: I have not designed an actual PCB that made it to production since last century. Only recently I start to think about putting time into such things again. Especially since it's now so cheap and easy to get them made. Hmm, I looked at KiCad many years ago and rejected it for some reason back then. I'm guessing it's had a growth spurt of late. I note there is two versions, 4 and 5, up for grabs. Looks like v5 is not considered release version yet. Yes. And I use Protel 95. All those footprints that you build are too hard to remake again. I have SMT and HandSMT versions of many SMT parts. You need bigger pads for hand soldering but you can squeeze more on a board with the reflowed parts. I know the software, faults and all. It works. I don't require any additional features. I own a real copy. And I have 99SE but just haven't made the transition, not that it's much improved. KiCad has had a few 'growth spurts'. I tracked it casually until they added the Shove router, and then it became serious. Recently, Digikey has backed it, with some donations and a library effort. V5 is in 'release candidate' mode, which means it is close. For evaluation, I'd suggest running V5, as it has a lot of improvements, and has been quite stable in the tests I've done. V5 also has a much improved Eagle importer, and the PCAD-PCB importer looks quite good. That gives 'harvesting' pathways. OK. I can quite understand the reasons for sticking with it. Familiarity, continuity, lock-in. It's pretty amazing considering almost half the world's humans are younger than Protel 95! KiCad is in use and developed by the guys at CERN. https://giving.web.cern.ch/content/kicad-development-2. So I expect great things of V5 and up, great enough for me anyway, which I now have installed ready for a test drive. If I was starting out, I'd sure give kicad a go. And likely will sometime in the future. Protel 95 won't run under W10 which is the reason I am looking at Protel99SE. But I do have a W7 laptop where I do my pcb designs. @Cluso99 - I run my Protel99SE in WINXP in VirtualBox, so it shouldn't matter what that runs on and one of the good things about VirtualBox is that your whole virtual O/S is one big file that you can go clone onto another machine and run it the same way etc. btw - Protel99SE is far more integrated than 95 which is why they call it "Design Explorer" and basically your project would include schematic and pcb and spreadsheets and gerbers etc all together. I kinda remember 95 and in comparison 99SE was a definite step-up. I do like Diptrace though but I have had Kicad V5 loaded onto my PC this past week or so and although I haven't been able to import anything, it does look good. Diptrace was able to load the PCAD export of P2D2 from Protel99SE. I don't know if this is helpful to anyone, but for me, the trick to learning KiCad was to study the many KiCad "How To" videos on YouTube. I initially tried quite hard to learn KiCad from the manuals but gave up because it seemed so complex and counter-intuitive. However, when you see someone do it on YouTube, you see that KiCad is actually very simple to use - it is just the manuals that make it appear complex. It also has a lot of nice shortcut keys that are great time savers, and it is very easy to make new device schematics and footprints. I find the library management a bit messy, but it works, and you soon get used to it. I have also tried Eagle and Altium Circuitmaker but I keep coming back to KiCad. I am on a Mac (High Sierra), and it seems to work perfectly. I don't know what it is like on a PC or Linux.